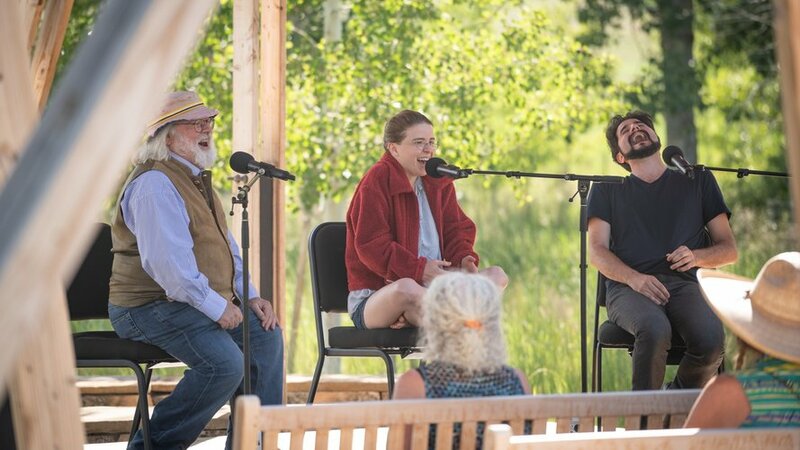 We’re just a few weeks into the summer season at Tippet Rise, yet we’ve already experienced many moments of laughter, beauty and joy. In late June, our neighbors from Fishtail and up and down Grove Creek Road joined us here at the art center for our annual community barbecue. The celebration included music by talented young strings players from nearby Billings, Montana, plus the High Country Cowboys, the award-winning cowboy singers whose yodeling and harmonies have been compared to the Sons of the Pioneers. Classical recitals, three weekends’ worth in all, in the Olivier Music Barn and beneath the Domo have inspired encores and wonder. Beneath the Tiara Acoustic Shell on a recent Sunday, the celebrated pianist Pedja Muzijevic, accompanied by members of New York’s St. Luke’s Chamber Ensemble, entertained dozens of children and families during the first of the season’s Free Family Concerts. And art lovers from around the world have experienced the Tippet Rise land art and landscapes through our sculpture tours. In other words, it’s a great Season Three at Tippet Rise…and, there is still time to join us! Seats remain available for tours of our monumental sculptures from now through the end of the summer. In addition to touring by van, guests are welcome to hike or bike the trails that wind their way from installation to installation. For more information about tours, and for reservations, which are required for all tours and visits to Tippet Rise, please click on the link below. Thanks, one and all, for your support of the art center!